People come to Ladew to see the topiary. They know about the topiary but may not know about the gardens. What? Gardens? Oh yes, fifteen of them, arranged in garden rooms. 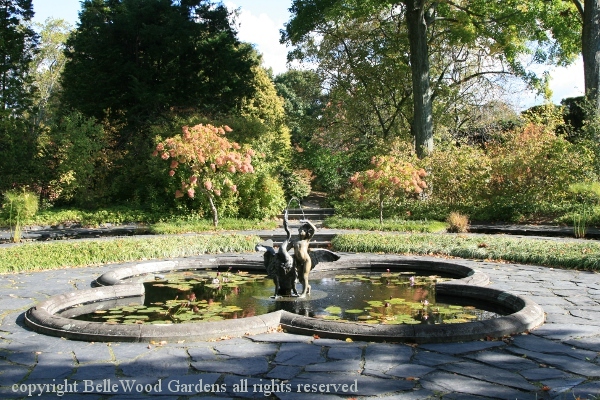 There's the yellow garden, the woodland garden, garden of Eden, the white garden, whatever attracted Harvey Ladew's imagination. Some of the garden rooms are walled with hedges. This one, with brick. 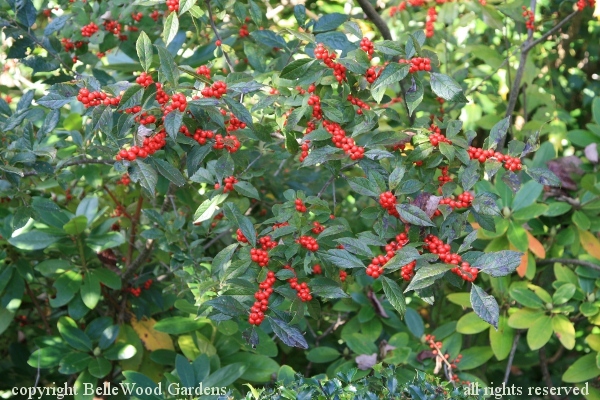 such as viburnums and this Ilex verticillata with sealing wax red berries. 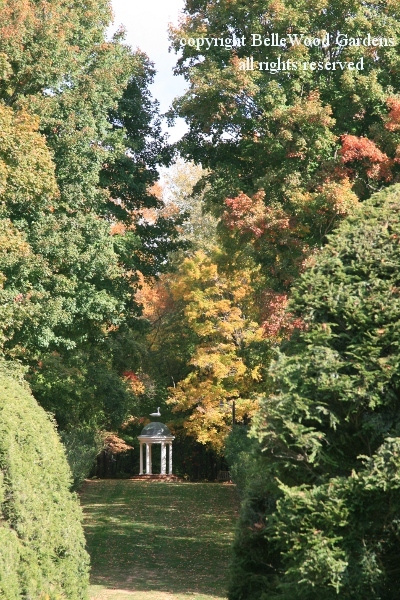 Even this late in the season the Yellow Garden still has much to admire. 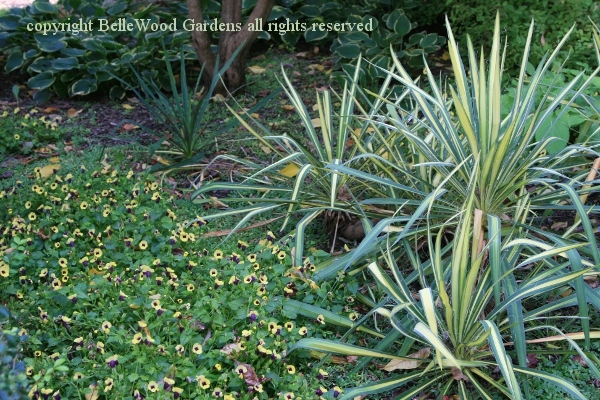 A yucca with yellow variegated leaves pairs up handsomely with a purple-eyed yellow torenia. Though it would have been appropriate that's not where we saw Iris 'Billionaire'. 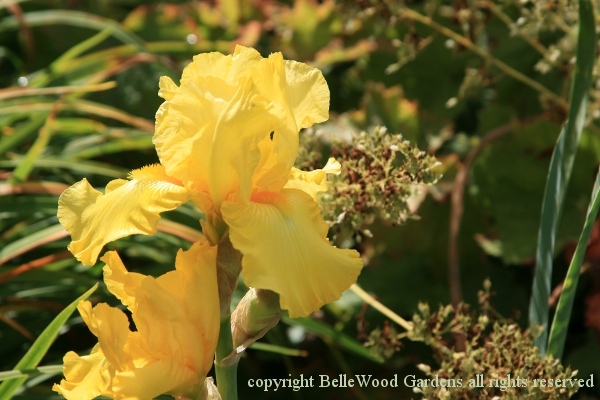 It was, equally appropriate, in the Iris Garden. 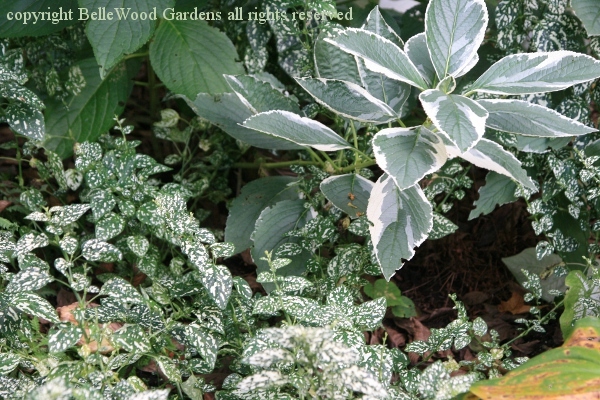 A crisp, fresh combination in the White Garden makes use of foliage: Cornus alba 'Elegantissima' paired with Hypoestes 'White Splash'. 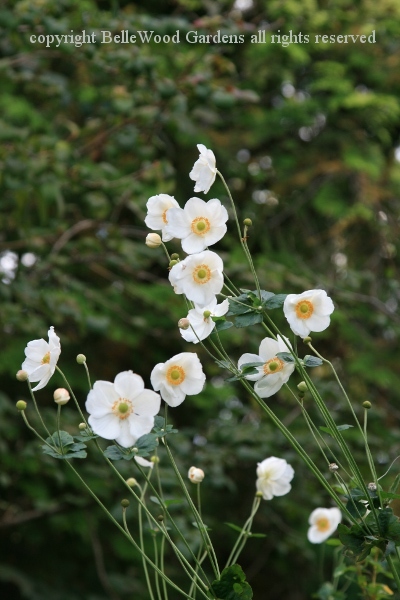 And also in the White Garden, Anemone 'Honorine Jobert' displays its clean white flowers carried on self-supporting stems. It has been selected by the Perennial Plant Association membership as the 2016 Perennial Plant of the Year. 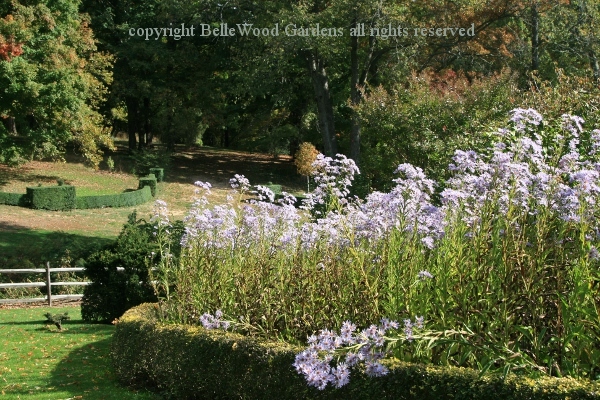 Autumn in the garden, a sprawl of Aster tataricus 'Jin Dai', named for the Japanese garden in which is was found. Believe it or not, this is "dwarf" compared to the species. 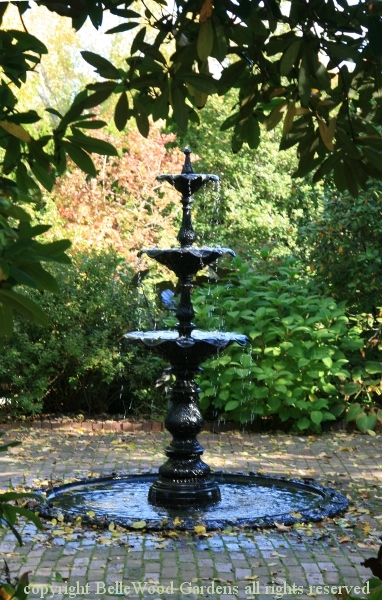 There's water, from a rill in the Yellow Garden, a streamlet in the Iris Garden, and several garden rooms embellished with fountains. 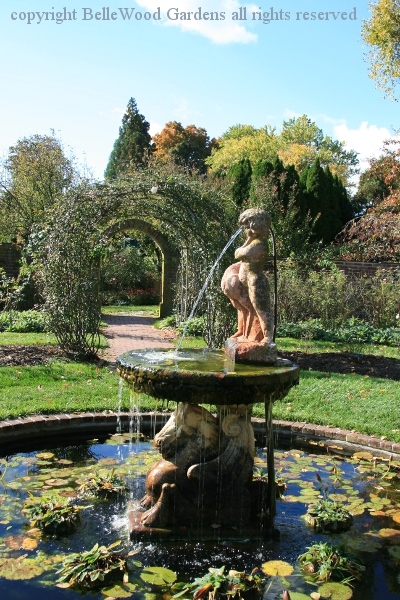 and in another courtyard a quatrefoil water lily pool has a boy with swan fountain. 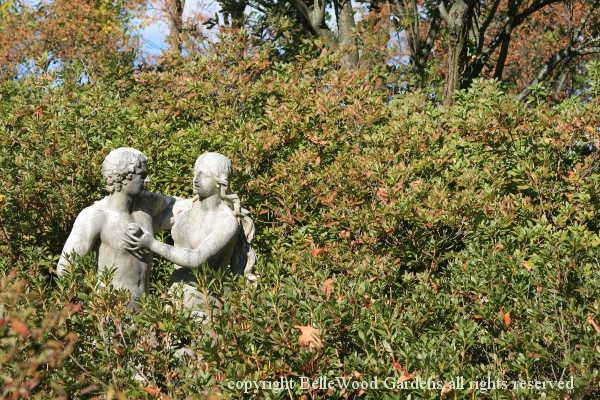 In the Garden of Eden, an unusual, whimsical statue of Adam and Eve stands under a canopy of apple trees. Eve is offering Adam the traditional apple. But Adam already has two in the hand he's holding behind his back. 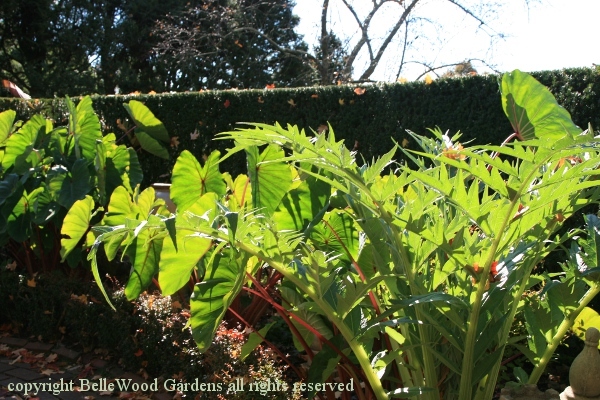 Nearby, sunlight illuminates bold foliage for a sculptural effect of its own. 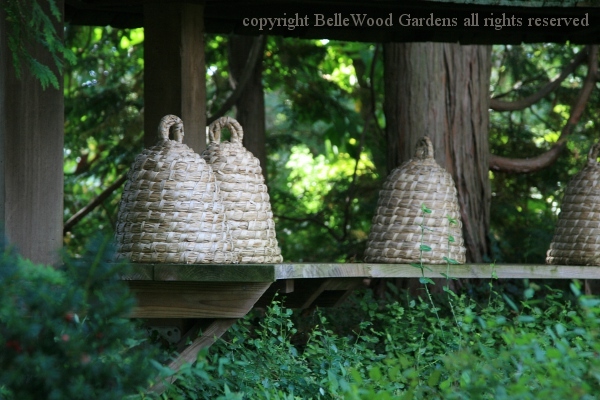 Bee skeps, appropriate for a country garden. 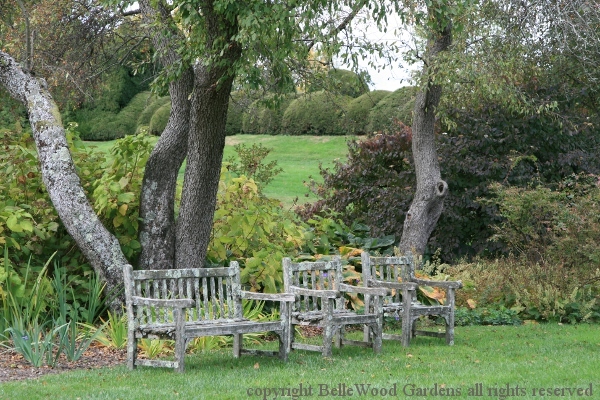 Peaceful and serene, two lichen covered chairs and a bench aging in place under the trees. And up a little hill, set among the trees, a folly. 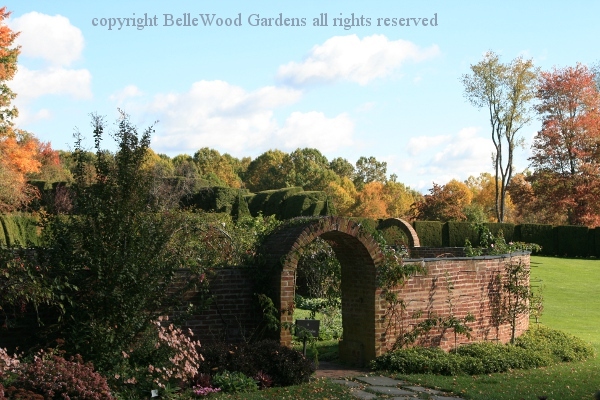 Go here for a look at some of the classic topiary.